"Best Neighbhorhood Site Plan-Up to 20 Acres"
"Attached Suburban Residential Project of the Year"
Nestled comfortably into the Texas Hill Country of west Austin, with decks overlooking the distant downtown skyline, The Hillside brings a contemporary urban edge to luxury home and condominium living. 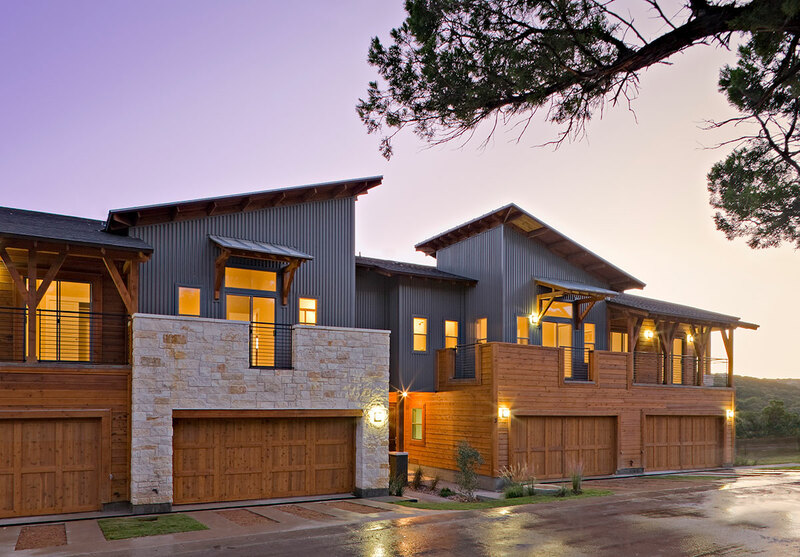 Native Austin white limestone mingles with rustic stained cedar and metal siding to create a unique mix of single family and attached homes spanning 51 acres. The 101 homes in The Hillside range between 1,315 and 2,395 square feet, with roof finishes a combination of seam metal and composition shingle. The Hillside boasts a community pool and cabana area completely finished with local limestone. Adjacent to the masonry fireplace and B.B.Q. area, the pool and spa feature a contemporary zero edge and waterfall. This project’s design proved challenging due to steep site conditions; each building had to be evaluated individually and the height restriction of 28′-0″ addressed. Additionally, all designs had to accommodate the preservation of existing trees and boulders. Sitting along a high bluff and surrounded by more than 24,000 acres of lush nature preserve, The Hillside blends natural elements with modern character to uniquely establish itself as Urban Hill Country.